Ok, this may not be my Dad’s chili. In fact there is a pretty good chance it originated from one of the cookbooks found in my parents kitchen. Fortunately, one never really uses a recipe for chili (or do they? I don’t) so I’m going to continue thinking of this as my Dad’s concoction. I tend to make this whenever it’s cold out, or I’m thinking and missing my dad. 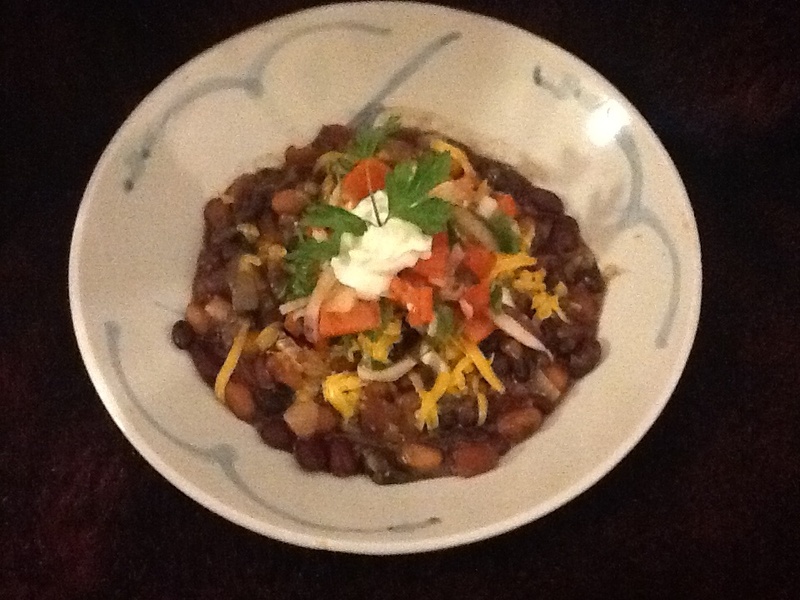 While I did just SEE my dad, we haven’t “talked” in awhile, and I guess I miss him…so I made his chili. It’s a crowd pleaser, can be made as easily for a large party as it can for two, and is great as a leftover, or can be frozen. It’s vegetarian, but obviously, you can add meat if you so choose. I find I tend to add whatever vegetables I have in the fridge, but you don’t have to add them either. Zara eats it (sometimes) and my husband always takes it for lunch. Z of course helped me make it, it takes a little more time than your run of the mill dinner, but it’s worth it. Zara typically helps stir everything in the pot. She also likes making the salsa. Today I taught her how to grate cheese using a standing grater and it might have been better than Santa Claus (although, she ate most of the cheese before it got to the table). Sauté the onions and garlic in the olive oil for about 5 minutes, then add the tomatoes and the beans. Simmer for 30 minutes. Add spices and taste. I the add a fresh salsa to top the chili and mix it in. 1/4 red onion finely chopped handful of chopped cilantro touch of olive oil. Toss together and serve separately. Usually the chili is built with, chili, cheddar cheese, salsa then sour cream. Mix, enjoy! that is one good looking chili! !